Click here to go to the second part of Preserved..
To start this section, 7827 Lydham Manor leaves Paignton for Kingswear on the Paignton and Dartmouth Railway. This location is dear to me, I spent many childhood hours near here watching trains and later worked for both BR and the P&DR at Paignton. 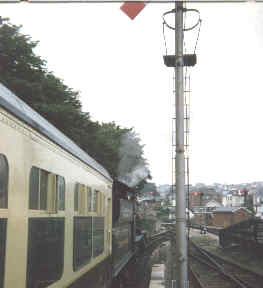 There are some more views of the present scene at Paignton on Paignton 2002. Moving back up country a bit, ex LMS Ivatt 2MT 2-6-0 46443 takes a Great Western 150 special alongside the New Cut heading for Wapping Wharf in Bristol's City Docks in the summer of 1985. 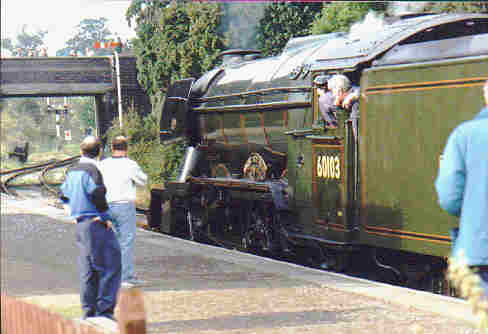 There were a number of special trains in connection with this anniversary including visits by 6000 King George V on long distance specials and trains such as this locally to Bristol. 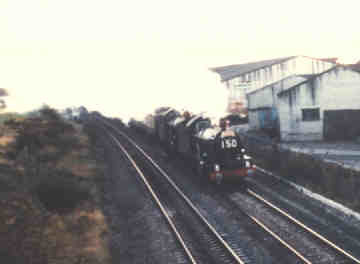 Another longer distance run was this one passing Bridgwater headed by a Castle and a Hall, both ex GWR 4-6-0s the Castles were express locos with 4 cylinders, the Halls mixed traffic ones with 2 cylinders and smaller wheels. Heading much further north, a Class 26 diesel preserved by the Speyside Railway at Boat of Garten. 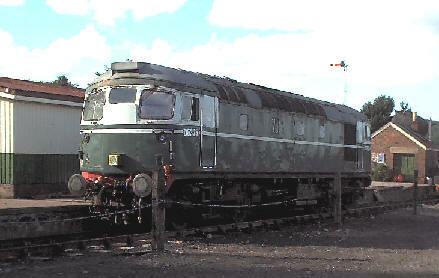 These locos were built by the same firm as the Southern's Class 33 but had a 6 cylinder engine instead of 8 to leave room for a steam heat boiler. Also on the Speyside Railway at Aviemore was the inevitable "Thomas", this one being in fact a former industrial 0-6-0ST shunting engine. 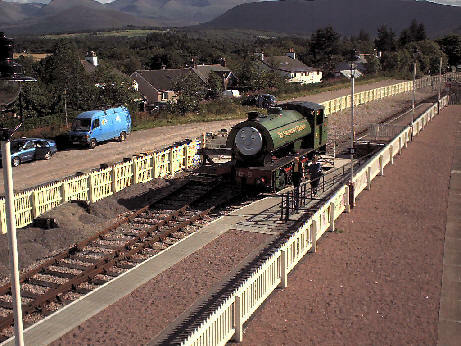 There's a much better view of of the Cairngorms, glimpsed in the background here, taken from the same location on the Scotland travel section and one of the Railtrack/Scotrail part of the station also taken from this footbridge on the Scotrail page. 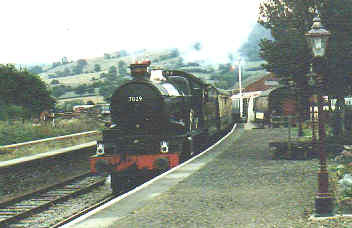 A rather better photo of a Castle class, 7029 Clun Castle at Winchcombe on the Gloucester and Warwickshire Railway. Clun Castle was the last GWR steam loco to remain in BR service, I can remember seeing her at Plymouth with one leg of the City of Truro Diamond Jubilee special, which commemorated the first recorded 100 mph achieved by a steam loco on Wellington Bank in 1904. A really famous one! 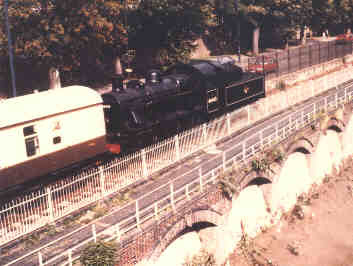 Flying Scotsman, seen here carrying BR livery and number 60103 also at Winchcombe on the Gloucester and Warwickshire Railway. After retiring from BR service Flying Scotsman was restored to original LNER livery and number 4472 and operated many specials like that, including one I saw at Exeter in 1963. Since then she had a spell in Australia before thankfully being repatriated.